Fuego de Cumbia (Cumbia Fire) ; Sigan Bailando (Keep On Dancing) ; El Manolo ; El Millo se Modernizó (The Millo Got Modernized) ; Canto de Zafra (Worksong) ; El Corcovado (The Wood-Quail) ; Mi Regreso (My Return) ; Puyaloahí ; La Celestina (Celestina) ; La Bajera ; Así Lo Grita Totó (That’s How Totó Shouts It) ; La Corniz (The Cornish Hen) ; Décima La Miseria Humana (Décima 'The Human Misery') ; La Acabación (The Ending). Los Gaiteros de San Jacinto have been an institution in the Colombian music scene since the 1950s when they began to represent through worldwide tours the quintessence of Colombian folk culture and, ultimately, the Colombian nation. However, the group itself traces its inception to the 1930s. In this, their latest offering for the ever expanding and fascinating Smithsonian Folkways series, the group, which now spans generations, breaths new light into the tradition ensuring its contemporanity and relevance for today's audience. This recording, above all, evinces the power musical traditions posses in enabling a culture to understand itself amidst political upheaval, economic disappropriation and community displacement. Gaita is a broad term referring to a flute-type musical instrument, various genres, and ensembles deriving from the Montes de María region on the Caribbean coast of Colombia (the term should not be confused with the Spanish gaita which is, of course, a bagpipe). The music was originally conceived in order to accompany feasts and funerals but can no longer be heard in such community events; rather they are mainly performed along the festival circuit and urban discos. Ana María Ochoa explains in her lively liner notes that the cumbia style, which is featured heavily on this recording, originated through the intermingling of Spanish, African and indigenous peoples as far back as the 16th Century and has since become one of the most popular social dance forms of the Americas. In the opening track we hear the singer and poet Rafael Pérez García sing: It is the fire of my cumbia / It is the fire of my race / A fire of pure blood (Un fuego de sangre pura) / Sung in laments. The cumbia clearly articulates Colombian iconography in addition to the communal ideal of racial intermixing in which African drums, indigenous gaita, and Hispanic poetry are fused with rhythms that cannot fail to induce wellbeing in both listeners and performers. 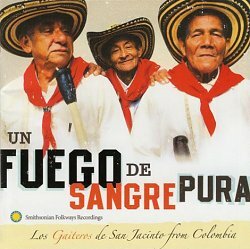 In addition to the iconic assertions of Colombian identity, the title of this recording also points towards the socio-political climate which has framed the lives of the musicians, many of whom had been affected by the economic and social hardship that has afflicted the country in recent times. The music is impassioned and frequently virtuosic: the gaitas (wooden duct flutes) predominate in the 14 selections offered in this recording. They are often heard in conversation with each other repeating short motivic patterns which form the basis for improvised melodies, harmonic effects and heavy ornamentation. The timbre is raspy, breathy and raw which is, in turn, emblematic of the vitality of the music, the musicians and the musical culture. However, a rare departure from this iconic sound places us in perhaps one of the highlights of this thoroughly recommended disc: track 5, Canto de Zafra (Worksong) an a capella rendition traditionally sung by elders alone in the countryside. Together these tracks evoke an incredible spirit of place and of endurance.